One of the biggest problems experienced by parents of children with long-term medical conditions is communicating and maintaining relationships with medical professionals. When the child has a rare disease or a condition so rare it remains undiagnosed, it can be even harder. They experience feelings of isolation and sometimes even of being looked on with suspicion if doctors can't pigeonhole the diagnosis. We reported earlier this year that SNJ columnist and Just Bring The Chocolate blogger, Renata Blower, whose son, Dominic has an undiagnosed 'syndrome without a name', worked to create a nursing position just for undiagnosed children at Great Ormond Street. 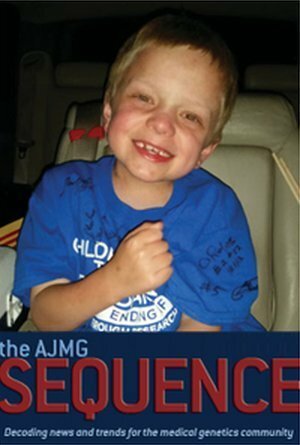 An article was published recently in the American Journal of Medical Genetics that looked at the plight of undiagnosed children and their families entitled, "Respectful communication by geneticists important for parents of children with undiagnosed disorders. "1 It looked at parents' views of their relationships with Geneticists and how they felt it could be improved. The parent panel was part of a session, Community Conversation: The Journey of the Undiagnosed and the Rare. The article was originally behind a "paywall", in other words, inaccessible unless you could shell out a fee to read it. However, we felt it was important for this article to be available for parents to see and share with medical professionals, so we used our patientINFORM partnership to request that the link be opened up to the public. As a result, you can now read this article online or as a pdf. Find it via SNJ here. In the panel discussion research, parents said geneticists should pay extra attention to how they communicate with families lacking a diagnosis and treat their relationships with families as partnerships. They want to be engaged in open communication that fully discloses facts about the diagnostic process, testing, and research. The study is easy to read in full yourself, but we thought we would sum up the article's 'Top Tips" in case you don't immediately have chance to do so. Communication and Partnership: Good communication stems from treating families as equal partners in a child's diagnosis and care. Give parents the correct medical terminology too: Parents desperate for diagnoses keep close tabs on research, a process made easier with the correct medical language. Even if parents do not understand medical jargon immediately, over time they will. Having the proper terms allows parents to communicate important medical information to other specialists. Full disclosure on genomic sequencing: Open communication and full disclosure should also apply to discussion of complex, expensive genomic sequencing. Genetics professionals should better emphasise that just because there are no answers from exome sequencing doesn't mean there's nothing there. Write Up details of each appointment: Parents felt it was important to get accurate written reports after appointments. People Skills: Being friendly and expressing concern for patients and families by asking about their lives isn't a superficial aspect of care. Getting a glimpse of families' daily lives lends insight into children's symptoms and abilities and makes families feel more comfortable. Don't dismiss parents' own research: Geneticists should also avoid criticising parents' own research. One parent said that while geneticists had advised her to limit Internet queries, “What's more helpful is advice about doctor- approved, credible sources for evaluating information,” Parents' suggestions may be based on symptoms or behaviour that aren't evident to the physician during the office visit. Ask about good days and bad days: Geneticists should ask families if the child has good days and bad days. This can help identify why certain days are good and what can be done to repeat them and increase quality of life for the child and whole family. Don't make comparisons or assumptions: Do not compare children or predict how a child will fare in the future, A parent said that a non-geneticist once likened her daughter to another patient who also had food sensitivities but was dependent on a feeding tube and advised her to expect one for her daughter even though he hadn't done any tests at that point. It's hard for anyone to know whether a child, especially an undiagnosed one, is the best-case or worst-case scenario of a disorder. Making assumptions early in a child's life can be detrimental to morale. If your family is affected by rare condition, visit the Rare Disease UK site. While many research articles are already open for public viewing, far more have to be paid for to be read, unless you have medical access. This is where our patientINFORM partnership can help. Access the links via our "Read Medical Research" page where we will be adding previously inaccessible research articles of interest from a large range of journals about learning disabilities, autism, psychology, mental health and many, many medical conditions in young people. We'll be adding a page soon about how to find articles, but for now, you can start by using Google scholar. You may find what you need is already open access but if it isn't, just register on the SNJ site and you can request your own article.